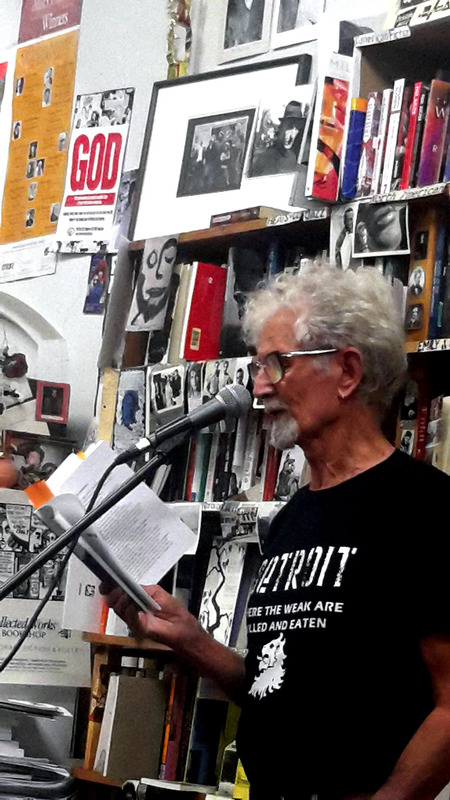 John Hawke launched Ticket to Ride by Philip Hammial, Island Press 2015, at Collected Works Bookstore on Friday 27 March 2015. Philip Hammial reading at the launch of Ticket to Ride. the unravelling of this sentence, forgotten. This cubistic approach results in a kind of fractured Alice in Wonderland effect of interlocking planes, and the speaker of these poems, like Alice, is constantly posing inscrutable questions of ontology: ‘Get real! Get real? That time I crossed a hare with Dale Evans, a fox with Roy Rogers, was that real?’ The key thing about Philip’s poetry, I now understand, is that however bizarre or deliberately obscured the events described in his work might seem, everything he’s writing about is perfectly real: there’s none of the decapitated mysticism of Surrealism in his work, and his juxtapositions aren’t randomly generated by automatist procedures. The techniques he’s employing are actually a form of spatializing realism, creating a geography of the moment flattened within the complex of a sentence. I’ve been partially led to that realisation after reading Philip’s extraordinary unpublished autobiography, a tale as baroque and fantastic as anything in his work, and the lineaments of that story are evident throughout his poems. They’re contained within a kind of Immortal Story – if you remember the Orson Welles film – of a sailor’s journey to knowledge, as a kind of pure desiring machine for the accumulation of affects; these experiences are then documented, reassembled, and alchemised within the machine of the poem. Philip’s favourite author, the Cuban neo-Baroque poet and novelist José Lezama Lima, has a wonderful term which he takes from Vico: ‘the impossible credible’. That’s the version of super-reality that I find expressed in Philip’s work, and I’d like to pay tribute by reading a paragraph from Lezama Lima that defines this precisely: he writes, ‘In the mastabas of ancient Egypt, a door was always left open to receive the magnetic winds of the desert. Great winds that the dead continue to receive. The penetration of the pyramids northward in the parched lands caused the queen’s chamber to be constructed with the most favourable orientation possible for receiving the magnetic winds of the genesial desert. Hence my belief that the construction of the pyramids was meant to create not only a lasting space for the dead but also a genesial chamber for the kings to procreate with the concurrence of the magnetic winds of the desert…For the Egyptians, the only talking animal was the cat, who could speak the word ‘like’ that could join together the two magnetic ends of its whiskers. These two magnetic points, infinitely relatable to one another, lie at the basis of all metaphoric analogies. It is a genesial, copulative relatedness. Join together the magnetic points of a hedgehog with those of a shepherd’s pouch, an example we are fond of, and a chestnut is engendered. The magnetic ‘like’ also awakens new species and the realm of supernature.’ (José Lezama Lima, “Confluences (1968)”, Selections ed. Ernesto Livon-Grosman (Berkeley: University of California Press 2005) pp.105-106.) Philip Hammial’s Ticket to Ride, along with the stream of exceptionally creative volumes that precede it, is a direct invocation of precisely that supernature which Lezama Lima describes. John Hawke is a Senior Lecturer in literary studies at Monash University, and recently coedited (with Ann Vickery) the anthology of critical essays, Poetry and the Trace. A selection of his poetry will appear with Cordite Press in 2015 http://corditebooks.org.au/collections/frontpage/products/aurelia. This entry was posted in Island Press, Issue 14, John Hawke, Philip Hammial, Ticket to Ride and tagged Anatomy of Melancholy, Arthur Rimbaud, Australian Literature, Australian poetry, poetry by Mark Roberts. Bookmark the permalink. All the best with Ticket to Ride: a great speech to launch it.